The changes were seen as most effective on the large landmasses in Asia and North America, where many areas fall into a single group (C) in the Köppen-Geiger system. For example, under the standard Köppen system, Washington and Oregon are classed into the same climate zone (Csb) as parts of Southern California, even though the two regions have strikingly different weather and vegetation. Another example was classifying cities like London in the same climate group (C) as Brisbane or New Orleans, despite great differences in seasonal temperatures and native plant life. Trewartha's modifications to the 1899 Köppen climate system sought to reclass the middle latitudes into three groups: C (subtropical)—8 or more months have a mean temperature of 10 °C (50 °F) or higher; D temperate—4 to 7 months have a mean temperature of 10 °C or higher; and E boreal climate—1 to 3 months have a mean temperature of 10 °C or higher. Otherwise, the tropical climates and polar climates remained the same as the original Köppen climate classification. This the tropical climate realm, defined the same as in Köppen's scheme (i.e., all 12 months average 18 °C, 64.4 °F, or above). The "A" climates are the realm of the winterless frost-free zone. Climates with no more than two dry months (defined as having less than 60 mm, 2.4 inches, average precipitation, same as per Köppen) are classified Ar, while others are classified Aw if the dry season is at the time of low sun/short days or As if the dry season is at the time of high sun/long days. There was no specific monsoon climate identifier in the original scheme, but Am was added later, with the same parameters as Köppen's (except that at least three months, rather than one, must have less than 60 mm average precipitation). BW and BS mean the same as in the Köppen scheme. However, a different formula is used to quantify the aridity threshold: 10(T − 10) + 3P, with T equaling the mean annual temperature in degrees Celsius and P denoting the percentage of total precipitation received in the six high-sun months (April through September in the Northern Hemisphere and October through March in the Southern). If the precipitation for a given location is less than the above formula, its climate is said to be that of a desert (BW); if it is equal to or greater than the above formula but less than twice that amount, the climate is classified as steppe (BS); and if the precipitation is more than double the value of the formula the climate is not in Group B. Unlike in Köppen's scheme, no thermal subsets exist within this group in Trewartha's, unless the Universal Thermal Scale (see below) is used. 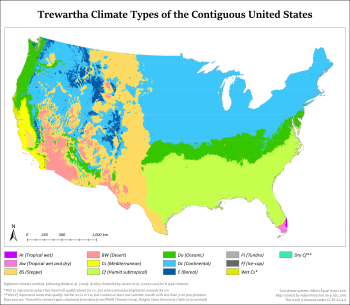 In the Trewartha scheme the "C" climate group encompasses Subtropical climates that have 8 or more months with a mean temperature of 10 °C (50 °F) or higher. There are only two types within the "C" or subtropical climate group, Cs which is a dry -summer or Mediterranean climate, and a Cf or humid Subtropical climate. Cw types occur within the Cf group and mean subtropical Monsoon climates (like much of east Asia). In the Trewartha scheme the "D" climate group encompasses Temperate climates that have 4 to 7 months with a mean temperature of 10 °C (50 °F) or higher. "D" climate groups have two types – an Oceanic type (Do), where the coldest month has a mean temperature 0 °C (32 °F) or higher, and a Continental type (Dc), where the coldest monthly mean temperature reaches below 0 °C in some interior landmasses like North America and Asia. For the continental climates (Dc), sometimes the third letter (a or b) is used to denote a hot or cold summer. "Dca" is where the warmest month has a mean temperature of 22.2 °C (72.0 °F) or higher, and "Dcb" is used for cool summer temperate climates, where the warmest month has a mean temperature below 22.2 °C. This represents subarctic and subpolar oceanic climate realms, defined the same as in Köppen's scheme, where 1 to 3 months have an average temperature of 10 °C (50 °F) or above. In this climate zone there is only a short period (normally 50 to 90 days) that is frost free. In the original scheme, this group was not further divided; later, the designations Eo and Ec were created, with Eo (maritime subarctic) signifying that the coldest month averages above −10 °C (14 °F), while Ec (continental subarctic or "boreal") means that at least one month has an average temperature of −10 °C or below. As in Group D, a third letter can be added to indicate seasonality of precipitation. There is no separate counterpart to the Köppen Dfd, Dwd, and Dsd climate types in Trewartha's scheme, but a letter can optionally be added to the end of the symbol to indicate the temperature of the coldest month (see below). In the "Ft" climate type, at least one month has an average temperate above 0 °C or 32 °F (but not above 10 °C), so that there is a brief time when the surface might be free of snow or ice and a scrub or Tundra vegetation cover is possible. In the "Fi" climate type, all months have an average temperature below 0 °C, this is the region of the vast deserts of perpetually frozen Ocean in the North Pole, and the permanent ice plateaus of Antarctica and Greenland. Highland climates are those in which altitude plays a role in determining climate classification. Specifically, this would apply if correcting the average temperature of each month to a sea-level value using the formula of adding 5.6 °C (10.1 °F) for each 1,000 meters (3,300 ft) of elevation would result in the climate fitting into a different thermal group than that into which the actual monthly temperatures place it. Sometimes G is used instead of H if the above is true and the altitude is between 500 and 2,500 meters (1,600 and 8,200 ft), but the G or H is placed in front of the applicable thermal letter rather than replacing it. The second letter used reflects the corrected monthly temperatures, not the actual monthly temperatures. G stands for glacier for instances. e — excessively cold: −40 °C (−40 °F) or below. Examples of the resulting designations include BWil for Riyadh, Saudi Arabia; BWhb for Aswan, Egypt; Awha for Surabaya, Indonesia; Cfak for Tokyo; Csll for San Francisco, California; Cfhk for Dallas, Texas, U.S.; DObk for London; EClc for Arkhangelsk, Russia; FTkd for Utqiagvik, Alaska, U.S.; Cfbl for Melbourne, Australia; and FIce for Vostok Station in Antarctica. ^ Akin, Wallace E. (1991). Global Patterns: Climate, Vegetation, and Soils. University of Oklahoma Press. p. 52. ISBN 0-8061-2309-5.